"It's one of the best books on politics of any kind I've read. For entertainment value, I put it up there with Catch 22." --The Financial Times "It transports you to a parallel universe in which everything in the National Enquirer is true....More interesting is what we learn about the candidates themselves: their frailties, egos and almost super-human stamina." --The Financial Times "I can't put down this book!" 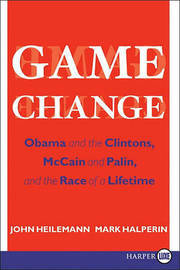 --Stephen Colbert Game Change is the New York Times bestselling story of the 2008 presidential election, by John Heilemann and Mark Halperin, two of the best political reporters in the country. 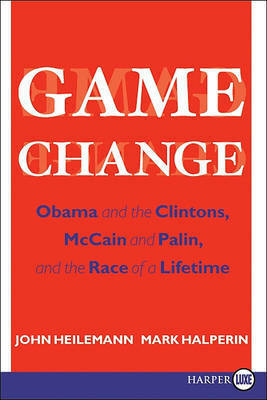 In the spirit of Richard Ben Cramer's What It Takes and Theodore H. White's The Making of the President 1960, this classic campaign trail book tells the defining story of a new era in American politics, going deeper behind the scenes of the Obama/Biden and McCain/Palin campaigns than any other account of the historic 2008 election. John Heilemann, national political correspondent and columnist for New York, is an award-winning journalist and the author of Pride Before the Fall: The Trials of Bill Gates and the End of the Microsoft Era. Mark Halperin is editor-at-large and senior political analyst for Time. He is also senior political analyst for MSNBC, the author of The Undecided Voter's Guide to the Next President, and the co-author of The Way to Win: Taking the White House in 2008.